« Woolwich Arsenal 0 Sheffield United 0. Sept 1910. I first stared to go regularly to Arsenal when I was around 6 or 7 years old. I don’t actually recall my very first game, it just seems to be that I have been watching Arsenal for so long and it’s what I do. Sadly the day it started has no significance to me. My father went to watch Arsenal around the time of his 10th birthday in 1950, and when I was born in 1968 my Dad was going regularly to most home games. My first real memories of watching Arsenal in the 70s are of standing on the Clock end, we used to stand right at the back and just a few meters to the left of the clock. We would arrive at the ground at about 2pm. I would turn up at the ground carrying a Drinks Crate that I would stand on during the game so that I could see. I remember as we walked into the ground that my Dad would go to the bar, get himself a pint and a coke for me and I would munch my way through a packet of Chipmunk crisps whilst my Dad spoke to the people he had met. I remember it as being dark and extremely busy, with lots of noise and most supporters would be smoking. The things that stand out are the fact that the home and away supporters were not segregated and contrary to popular belief there was actually very little trouble in the 70s at Arsenal. The only memory I have was a few men exchanging words when we played at home to Derby one year. It was a bit of noise and people standing up to each other. My dad moved me away and it stopped as quickly as it started. I know it was Derby because Charlie George had left us to play for them and as we had travelled to the ground my father had said how much he was looking forward to see him. The attendances would also vary so much form game to game and go form 60,000 plus down to 20,000 or so. Unlike today of course where the ground is constantly sold out and the pitch would often look like a mud bath by November and only start to recover towards the end of the season. 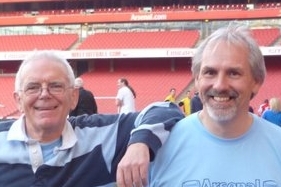 We occasionally met friends outside the ground and would meet them opposite the Arsenal main entrance in the East Stand. Here there was a caravan that sold teas and coffees and in the winter months I would have a Bovril which would invariably burn my tongue. I also remember the toilets underneath the clock end; they were awful and unable to cope with the amount of people trying to use them. Opposite the bar under the clock end was a sports hall which I believe was where the team trained. I also recall that if Arsenal were on Match of the Day (or The Big Match) that the TV lorries would be parked outside it. On one occasion we saw Brian Moore there and he kindly signed my programme for me. At half time I would make my way down to the bar area and get myself a Bovril and sometimes a coffee for my Dad. I would then make way up the steps at the far end of the Clock end and through the crowd back towards my Dad, by the time I got to him I had usually burnt my fingers and slopped most of the drink onto the floor. We would then wait at the end of the game for the crowds to disperse before making our way back to the car which would be parked at Highbury Quadrant and from there would make our way back to home to the Medway towns with invariably a stop off at the Dover Patrol (a public house on the A2 now demolished to make way for the road improvements) before finishing the journey. One of the biggest differences today apart from the improvements to the stadia was the songs that were sung by the fans. When I tell people about it today tend not to believe me, but anyone old enough to remember the song that greeted Frank Stapleton whenever he returned to Highbury will know what I mean. Other differences today are that people used to wear scarves as opposed to replica shirts. Along with the woollen scarves you still get today were Silk ones and it was fashionable to have this around the wrist. Replica shirts were not as widely available as they are today and the designs were very plain. I used to ask for a Arsenal kit for Christmas and would be delighted to get one. When I had football practise at school I think I was the only boy who turned up in a replica football kit, although there was one lad who had a Coventry city top, (living in Kent, God knows why). Its great while reminiscing about these times to remember some of the players that don’t get mentioned to often as we forget how spoilt for quality we have been in recent times. Eddie Kelly was my favourite player, I also liked Jimmy Rimmer (and recall that when he left us and went to Aston V that whenever he came to Arsenal a lady in the North bank used to give him flowers) and I had the pleasure of once meeting Ritchie Powling outside the ground before a match. He was in the process of making his way back from injury but I can’t remember if we ever saw him play again. Not long before segregation of the fans AFC played at home to West Ham, which would have been in the early 80s. West Ham brought a huge following and we decided for safety reasons to stand on the North Bank. A large number of West Ham fans who had gone into the North Bank to cause trouble let off an Orange coloured smoke bomb. We were right underneath the canopy and just at the point where you could not see the West Ham fans charging at the Arsenal supporters. After that my dad decided that we would no longer stand at football and after one season in the west lower we moved to the West upper, where we stayed until the North Bank was redeveloped in 1993. Editor’s note: Ian is the son of Roger Brookes to whom (you may have noticed) Making the Arsenal is dedicated. A full index of the stories we have collected in this series appears here. Some things that are true and that is going unnoticed like you say, Ian. I remember us buying scarves from Arsenal when we were there in 1979. No shirts as we didn’t see any of them in fact in the stalls on the street. I wonder if I still have that scarve from 1979….. I think I have lost it when we moved homes? I came to Arsenal rather late in life (my late 30s), so I wasn’t around to see the things you described even though I’m almost old enough — not that it would have mattered, as the games weren’t broadcast in the U.S. anyway. The scarf around the wrist is something I recognize from the 1972 flashback scene in “Fever Pitch,” as Luke Aikman (the younger version of Colin Firth’s character) was not the only one to do this. The smoke bomb against West Ham? Wasn’t that the May Day 1982 game where a Gooner was stabbed to death at Arsenal tube station? yeh im sure it was the same date that the arsenal fan was killed. You could see trouble was brewing from where i stood in front of the east stand at pitch level and quiet a few spilled on the pitch i seem to remember…..